Higher Edge is a FREE program that helps Seniors in high school get into college. Once they get into college, we stay with them and support them until they graduate from college. We are looking for Juniors to sign up for the program. 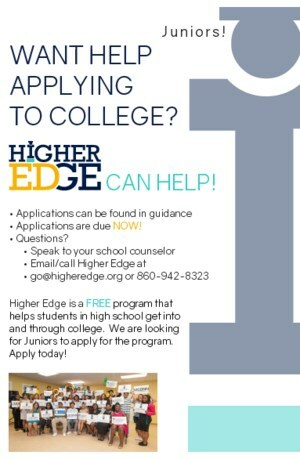 All they need to be a part of Higher Edge is to want to go to college, be on free/reduced lunch, and be a current students at Windham High School! Applications can be found at the School Counselor's Office.